there are two kinds of resorts that i was excited about everytime i visited. 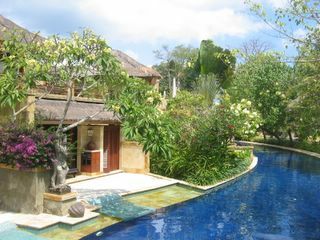 the resort that has plunge pools in each villa or the one like the picture above. this particular villa is a two-story modern looking one -- complete with a living room, dining room, outside jacuzzi on the first floor and a huge bedroom and bathroom upstairs. it is for you who wants to be pampered by the modern ammenities. 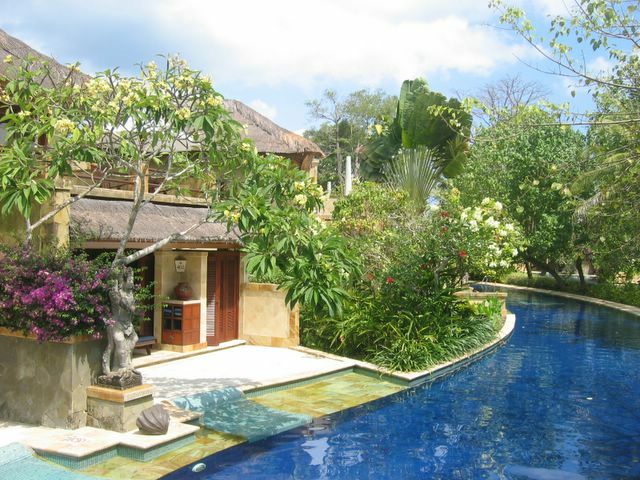 the nicest thing about staying here is you just can take a plunge anytime you want! and as usual -- a nice honeymoon villa with a nice jacuzzi outside you can skinny dip whenever you want -- and i got to stay by myself. eh man, dimana nih. apa namanya. di bali kah?